I would have almost forgotten to post about the Krishna Jayanthi/ Janmastami/ Krishna Janmastami special recipes, had it not been for my blogger friend Bingo’s Mom. She pinged me on whatsapp to remind me of this special occasion (I completely forgot the date even inspite of seeing posts from fellow blogger friends) and asked me if I had planned anything special. That got me thinking and here I am with the post. For me, while growing up Krishna Jayanthi (Birthday of Lord Krishna) meant a lot of celebration. Unlike other Gods, Krishna is worshipped as a Child God and that always meant the norms and rules are quite relaxed. Amma starts preparing the delicacies in the afternoon and we would do the Pooja in the evening. The sister and I used to draw little Krishna’s feet right from the main gate to our Pooja room to show how the little Krishna has graced our home. 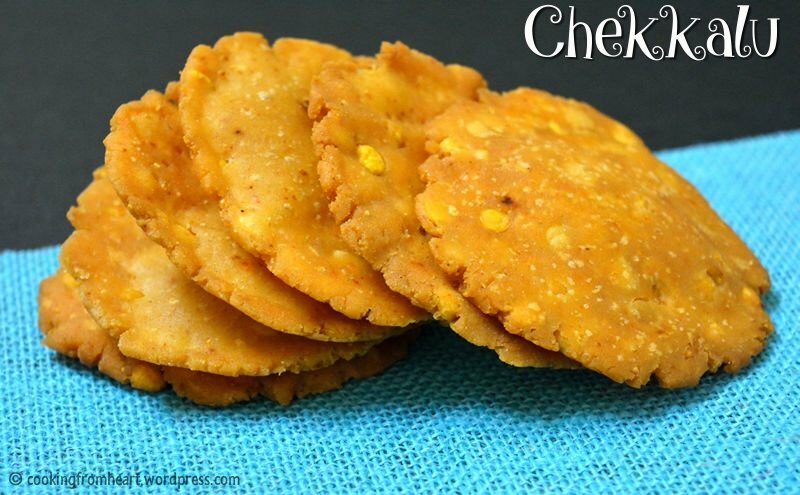 Amma usually made Thattai/Chekkalu along with Gavvalu, a special Andhra sweet by default. 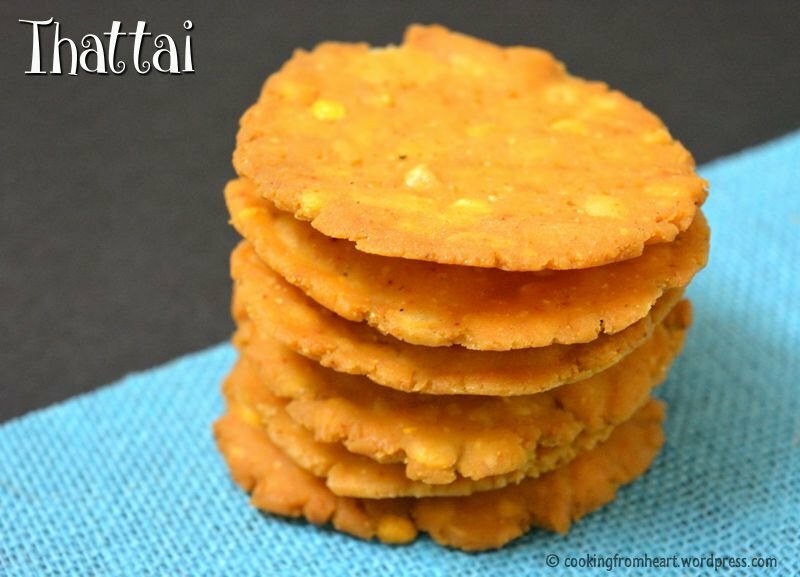 Depending on our interests that day, we used to make other delicacies but Krishna Jayanthi for me would be incomplete without Thattai/Chekkalu. The Thattai/Chekkalu preparation is not very tough and the version I am sharing today is my Amma’s recipe. My MIL’s recipe is almost similar except that she adds curry leaves and garlic pods – which would taste awesome too! The preparation of rice flour involves washing and drying the rice in shade (under fan) for 2-3hours and grinding it into a fine powder. Usually this is done in flour mills but these days its so hard to spot one. The flour is then sieved to get only the finest rice powder. To add to the crispness and lightness, Amma uses roasted gram powder (pottu kadalai or veyinchina senagapappu powder). 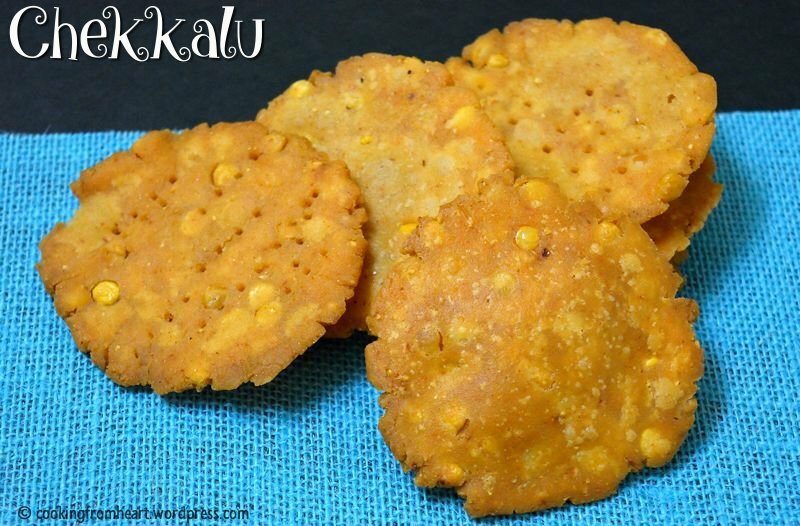 For the crunchiness and to have a bite, soaked bengal gram (kadai Paruppu or Senagapappu) is added. The dough that is made should be firm and these Thattai / Chekkalu (flattened crisps) are hand pressed and fried in oil. 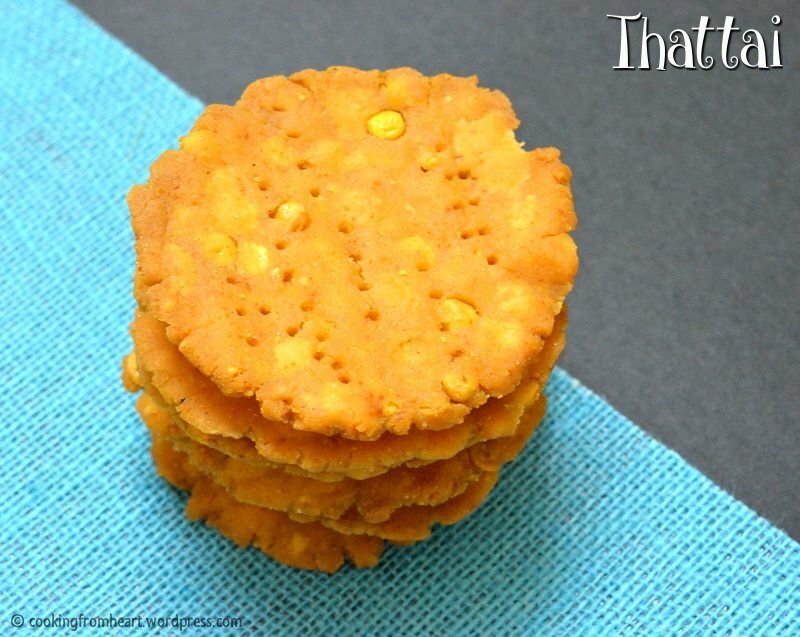 These stay good for a week when stored in an air tight container and would be awesome as a tea time snack! Soak bengal gram in enough water for atleast 30 mins. Drain the water, keep aside. 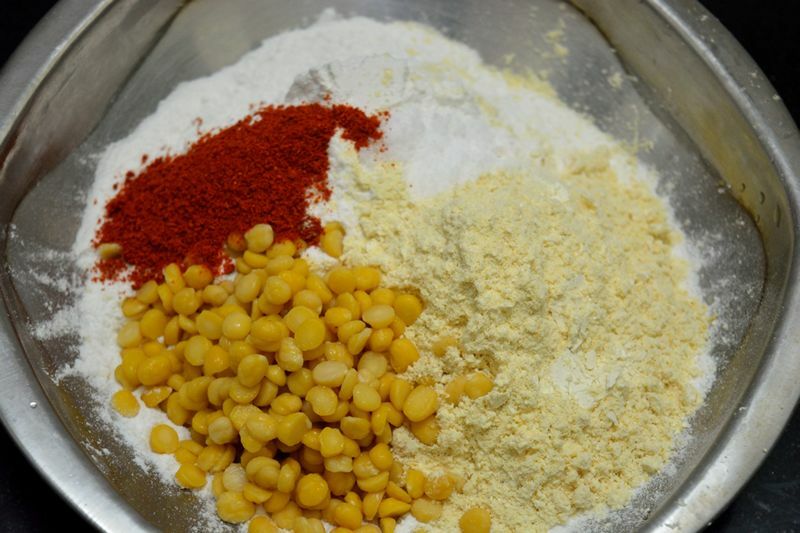 In a bowl, add rice flour, roasted gram powder, salt, soaked bengal gram and red chilli powder. Mix well. Add hot oil and mix well. 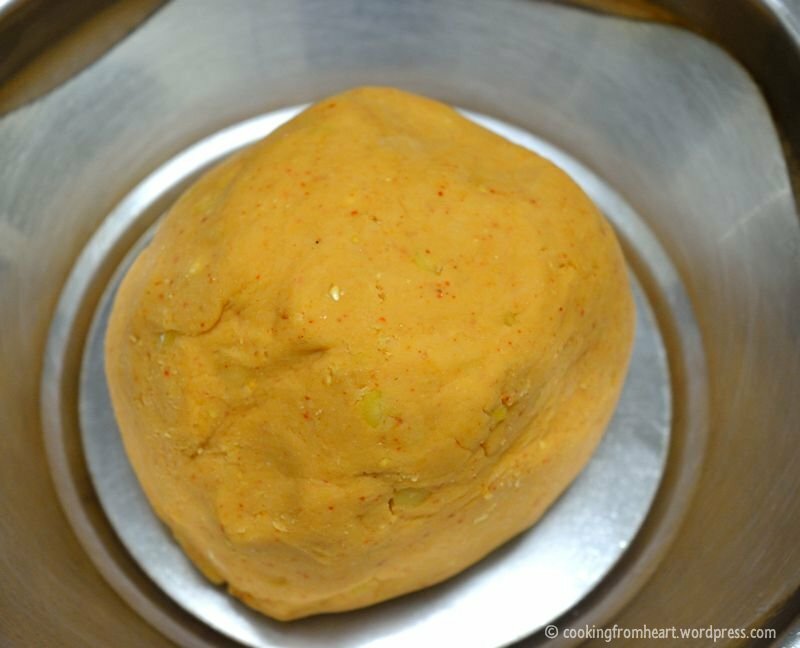 Add water little by little and make the dough for Thattai. The dough should hold together and be firm. Meanwhile, heat oil for deep frying. Once hot, reduce the flame to medium. On a plastic cover (or milk cover), apply a drop of oil. Take a small ball of the prepared dough and make a circle out of it using your palm and fingers. Make the circle as thin as possible. Prepare two or three Thattais at a time. Keep applying a drop of oil if the dough is sticky. Pierce each Thattai with a fork to avoid the Thattai from puffing up while deep frying. Gently remove the pressed Thattai/Chekkalu from the plastic cover and gently drop it into hot oil and deep fry until golden brown. Drain them on to a tissue paper. Repeat the procedure with the rest of the dough. Once the Thattais/Chekkalu have cooled down, store in an air tight container. I used the rice flour prepared by my MIL. The process to prepare the rice flour, wash and dry the rice under shade for 2-3 hours, grind into a smooth powder, sieve to get the rice flour ready. Adjust the red chilli powder quantity as per preferences. Adding hot oil while making the dough would result in crispy Thattais. The Thattais should be hand pressed and make them as thin as possible to get them crispy. The edges would not be too perfect but that’s ok. The hot should be hot while dropping the thattais but keep it on medium to cook evenly. Let them cool completely before storing in an air tight container. A great snack and love the stacks.